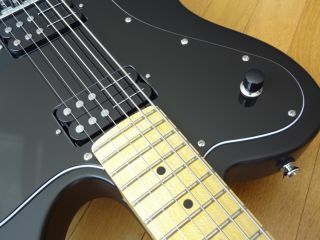 PRESS RELEASE: The Hyper Vintage bridge and neck model pickups are aimed at the player who likes a more traditional PAF style sound. Using Alnico 5 magnets and 42 gauge wire, the tone is warm, open, lightly compressed, with chimey highs. The Hyper Vintage is well suited for blues, classic rock, old school metal and punk, that "brown" sound, or for any player looking for a vintage vibe but wants the advantages of the Railhammer design. The patent pending Railhammers are designed by award winning guitar industry veteran Joe Naylor. Railhammers feature rails under the wound strings for tight lows, and poles under the plain strings for fat highs. The result is clarity that is similar to an active pickup, but with the harmonic content and organic tone of a passive design. Information taken from official press release, for more visit www.railhammer.com.